With "Once Upon a Time" over (finally) we got closure to the seven years of Disney remixes. So in honor of the show that should have ended three years ago, I've got a few of my favorite adaptations of Disney characters that "Once Upon a Time" did. The original Evil Queen from "Snow White and the Seven Dwarfs" was very flat. Her sole motives were about vanity and power. Now there's definitely evil in the world that appears so petty, but it's pretty one-dimensional. In constrast with our wanna-be beauty queen, Regina Mills spent seven seasons developing into a complex character. Season 1 revealed her backstory and why she had some much anger. Season 2 and Season 3 began her redemption as she fought for Henry's forgiveness. Season 4 and 5 she actively fought her dark side to find love and acceptance. Season 6 and 7 she flourished as a hero, maybe even surpassing Snow White in how she clung to hope. Disney's "Peter Pan" featured an immature little boy, who had a heart full of goodness, but also full of mischief. He brought his friends together and fought Captain Hook, mostly because he was a little boy craving buddies, but he was good. "Once Upon a Time" twisted that around 180 degrees. Instead of a fun-loving boy, we got a greedy old man (masquerading as a boy) who held more darkness in his heart than most of the villains the show featured. Each return of the Pied Piper was a chilling moment, right through until the end. All of his actions leading to power and selfishness. Tiana was a Disney Princess that I was not introduced to until years later. Her strength and bravery in "The Princess and the Frog" changed her life and Naveen's life. She had to learn to chill out a bit, but she clung to hope of something better. During Season 7, while many of the new characters left me underwhelmed, Tiana/Sabine was a faithful adaptation of the New Orleans princess. I would have liked if she was fleshed out more and more complex, but I liked the role-reversal of Tiana being royal and Naveen not. While keeping the basic traits of the character the same, the original Tiana was still flipped around, both in the Enchanted Forest and Hyperion Heights, to be a new Tiana. The backstory of the "real boy" didn't really change from the Disney version, so there was no actual adaptation of his backstory. Instead, we got an interpretation of what happened after. I'm not aware of any other Pinocchio that got tested after becoming a real boy. Does he remain selfless, brave, and true or not? Well, in this case we got to see both. August was a "real boy" in more ways than one; he was a good Pinocchio, but he was also a real person with real reactions to real problems. (I really liked "Once Upon a Time in Wonderland" so I had to include one of their characters. I thought about Jafar... but his Season 6 appearances left me wanting) I grew up watching "Alice in Wonderland" (my brother likes to remind me about how I watched it on repeat) so I can clearly picture the immature Alice traveling Wonderland and reacting to the fantastical world kind of naively. This new version of Alice was tough and willing to fight for her life and her love. She became a proficient swordswoman and she fought against the most evil sorcerer. In contrast, all the cartoon Alice could do was call the Queen of Hearts names. Not much was seen of the silly Mad Hatter in "Alice in Wonderland" and even less substance to the character. So as much as I enjoy "Alice in Wonderland", I loved seeing the Mad Hatter brought to life as Jefferson. Even just the backstory as to why he's crazy was a nice addition. The only thing I would have changed is letting us see Jefferson more... but I also like Sebastian Stan as Bucky Barnes, so I guess that kind of makes it okay. Cruella was a beastly character in Disney's "101 Dalmatians". I mean, in many ways she's probably one of the freakier and scarier Disney villains, even without any sort of power and influence, besides money and henchmen (Jasper and Horace). "Once Upon a Time" took that same darkness and evil into a character with some devious powers. Her backstory episode threw me for a loop. As they intended, I was guessing she had some tragic backstory about her mother, when instead we just a straight up sociopath. I've been having a bit of an 80's binge the last couple weeks, specifically with Netflix's Stranger Things and the novel Ready Player One. The fact is both of these pieces are fixated on the pop culture of the 80's. Now I was born in '86 so I didn't really have the He-Man experience, or remember when Ghostbusters came out. What I think is interesting is the popularity of both these properties and therefore the 80's themselves. I get it. The 80's was when geek culture first started actually making real money, both with the film industry and the budding video game world. It was an exciting time with Transformers, aforementioned He-Man and Ghostbusters, and the beginnings of the Anime wave on the horizon. We even got two good Star Wars movies out of the decade (Ugh what a time!). So while I didn't grow up cognitively in the era I get why those who did would remember it fondly for its contribution to geek culture. 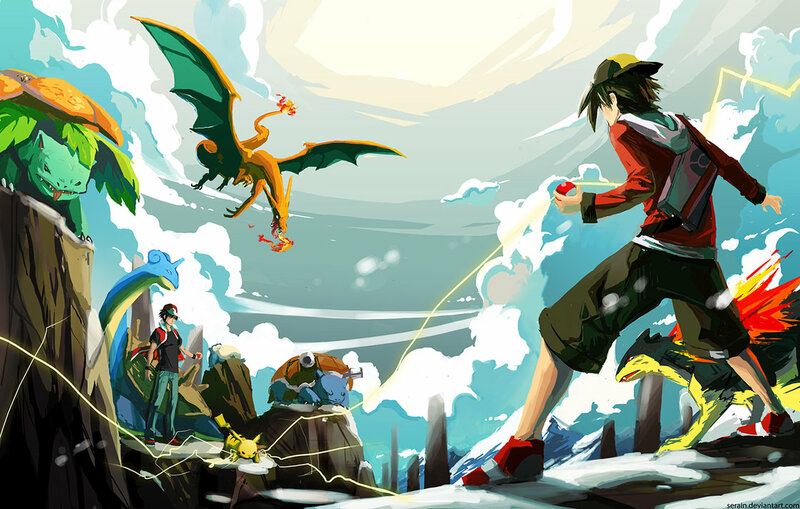 There's a theory that every generation gets fixated on a previous generation. The theory usually says it goes 50 years back but I think that with the advent of the Internet and the growing power of geek culture that the nostalgia fixation is starting to get shorter since the purse holders are getting younger and are enraptured with the newer stuff. A good example of this is from the 80's itself, which went through a period of nostalgia with the 50's (Who Framed Roger Rabbit to cite an example). 90's saw a bit of a 60's and 70's throwback, mainly through Austin Powers and the string of TV shows made into movies (Adam's Family, Beverly Hillbillies, Brady Bunch), but we didn't see much of it in the 2000's. Now we're in an 80's throwback and I think it's pretty tubular. Thinking about it if I were to make a big nostalgia song and dance I'd do a tribute to the 90's personally. 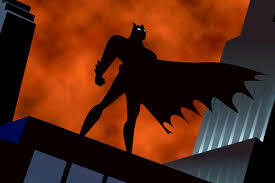 This decade is in the transitioning position where those who grew up in it don't want to think of it as nostalgia because frankly it makes us feel old, but here's a painful stab for you: Batman the Animated Series is 23 years old right now. Yeah, let that sink in. We're getting two movies coming up in the next year that's going to emphasize a love of nostalgia. First is Wonder Woman 1984, which will be set in the titular year and hopefully explain where she was for 70 some odd years. Then we're going to get Marvel's Ms. Marvel, which is set in the 90's. Could this be the transition into a 90's nostalgia? 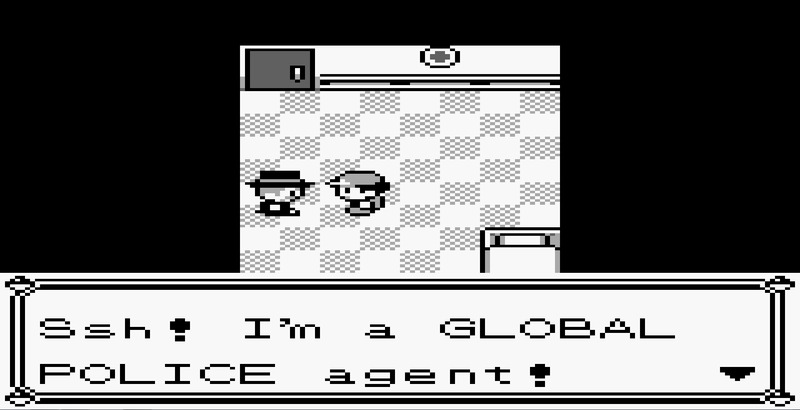 Will the Oasis 2.0 have to feature Tiny Toons world and Pokemon world? 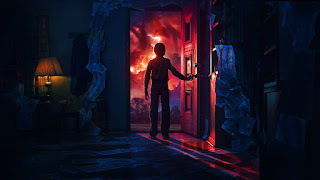 Will we get some supernatural Lovecraftian horror taking place inside a Blockbuster video and starring a cast of kids with Pogs and Giga Pets? What's your favorite part about the 80's or 90's? Which kid are you? I'm finally nearing the end of my Doctor Who post series (what am I supposed to do when I'm done? ), but for now here's the Doctor (though easily not my favorite) grew on me and took us to the 50th Anniversary of the series. To be fair I wasn't a big fan of this season because of Amy's obsession with the Doctor. As a result, the season (while good) was a bit slow for me.... though the Van Gogh episode was great.... I'll be addressing that in the near future. My love of this story though comes from the cyclical nature of the time travel. Episodes like this and Blink are satisfying to me, because that's the kind of time travel I'd subscribe to. Not the kind of time travel, like "The Flash", where everything can be messed up and manipulated. 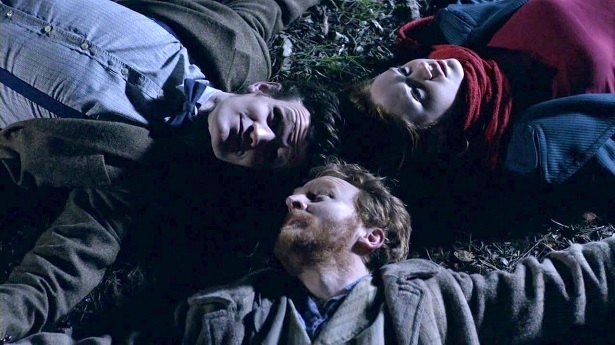 It was also the episode where Amy's obsession with the Doctor started to subside, so that was also very nice. Like many of my flop stories, this story was forgetable. Beyond how forgetable it is, I need to comment on the weirdness of the star whale. I like the whole Britain in space thing, but the existence of the space whale bugs me for some reason. Maybe it's the organism's inability to breathe in space? Or maybe it's just that it looks ridiculous? I'm not sure. 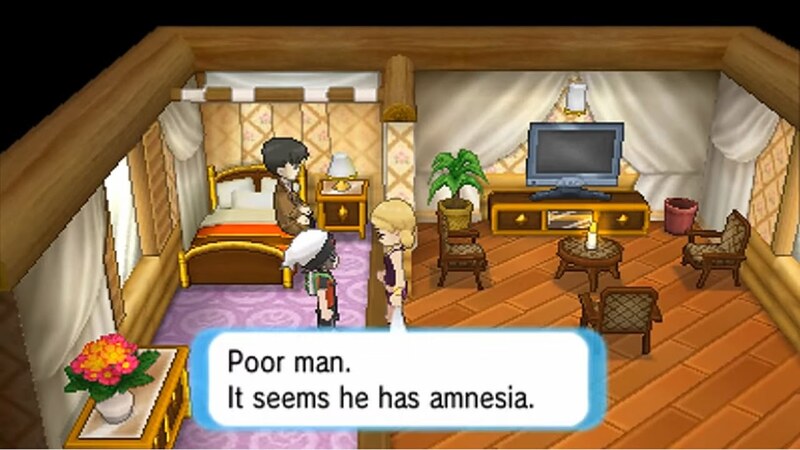 I'll delve more into this when I do a post on this episode, but I loved the physical representation of mental illness. Having dealt with anxiety and depression throughout different periods of my life, this episode was able to put into words and images what I've felt. But like I said, I'll get into that one more when I post about this episode. I loved getting a chunk of the River Song/Melody backstory. I don't exactly love that she ended up being BFFs with Amy and Rory growing up, but it was fun to see Black River flirting with the Doctor. Also great to see newly regenerated River Song bantering with him. Also, just the premise of the episode happening in Nazi Germany was great, considering very little of it had to do with Hitler. This episode kind of drove me crazy, giving Amy an escalated future and then having her refuse to go back and fix it. In some ways it's a good metaphor for forgiveness and resentment (being unable to let go of the past), but it also annoyed me. Maybe it's just that I already don't like Amy in this period of Doctor Who, but Old Amy's insistence of not changing the past bugged me. You lost 40 years of your life and you don't want to fix that? "Did you wish REALLLLLY hard?" For decades (ever since the First Doctor) it's been hinted that the TARDIS was more than a machine, a living thing. 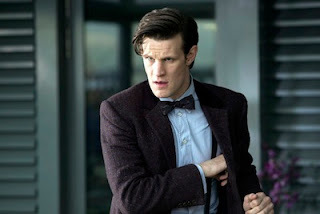 So here we actually got to see the Doctor's TARDIS in human form. It was also kind of fun to get the hint of other Time Lords. 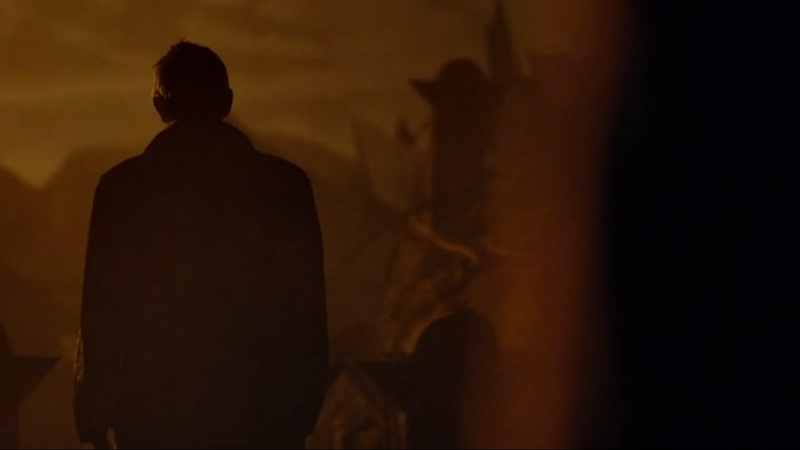 Of course, this became a bigger plot point towards the end of the Eleventh Doctor's era and into the Twelfth Doctor's time, as we got the return of Gallifrey, but it was cool to see other Time Lords teased before. Is it too sadistic for me to say this was my favorite because Amy finally left? Oddly enough I'd actually begun to warm up to her. But alas, she was finally gone. 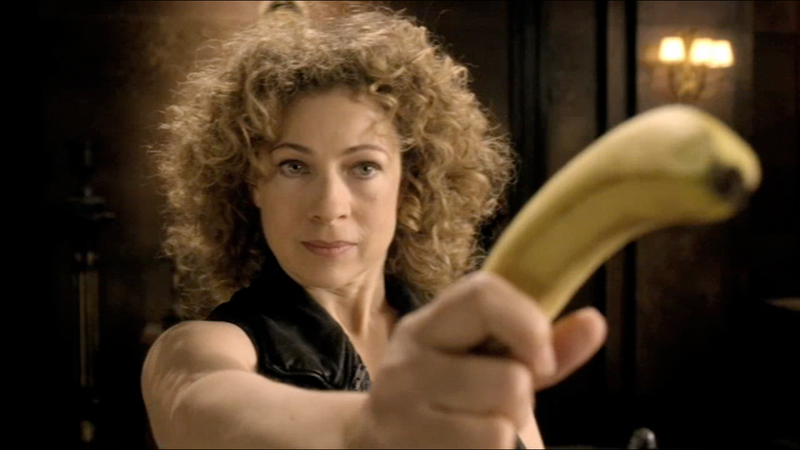 The sad part was that it was also the final pre-libary appearance of River Song for quite a long time. Besides my sadicism, I like the cyclicle nature of the time travel again, with River Song's book. 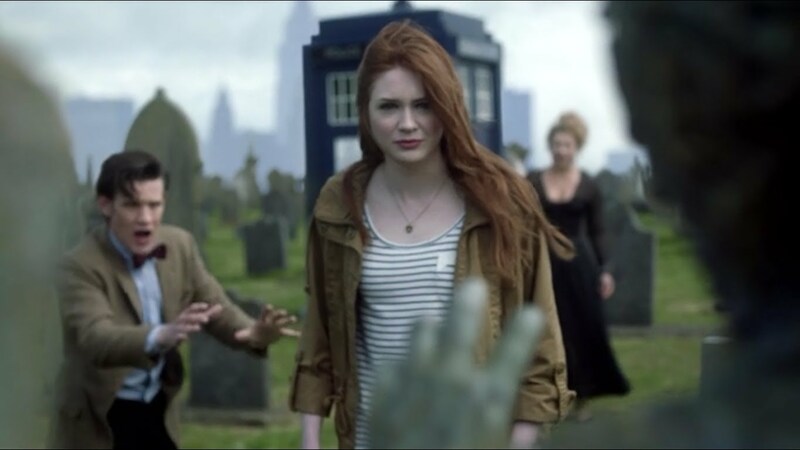 It was also a wonderful last major appearance of the Weeping Angels. And a good story at that. This story was among the forgetable. Also with it being a very peculiar love story/ghost story left me feeling unfulfilled. 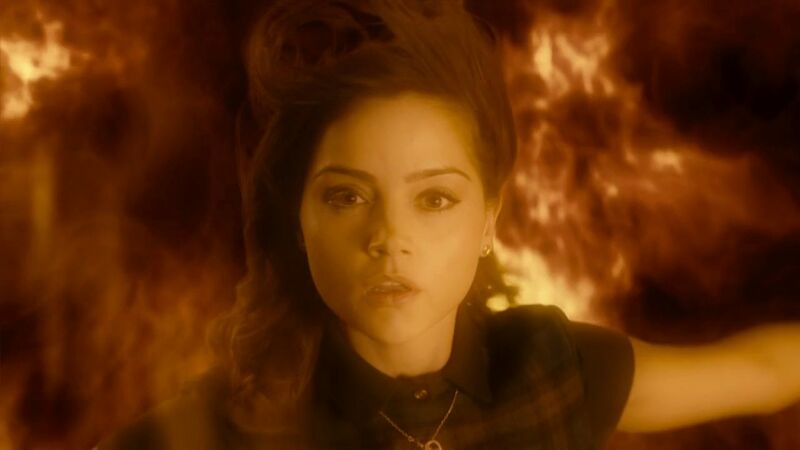 In the end, the whole point of the visit was just to get a vibe of who Clara really was. Nothing else really developed from this story. Just kind of blah. 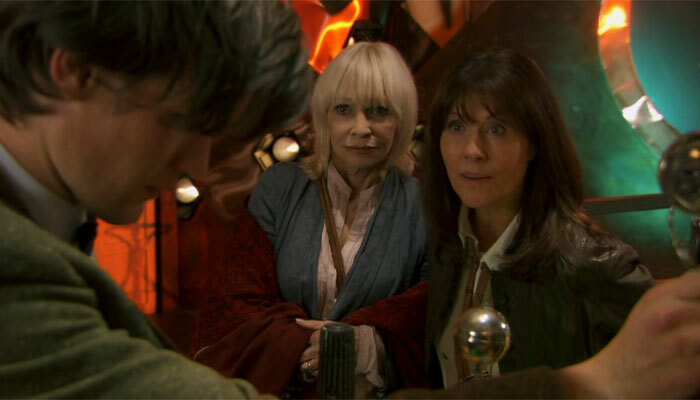 My favorite part of this episode (especially after having watched Classic Doctor Who now) was seeing glimpses into the other Doctor's adventures: "The Invasion of Time", "Arc of Infinity", "Dragonfire", and "Forest of the Dead". I love the callbacks to Classic Doctor Who, because it hints back to the fact that this show has such a rich, extended history. 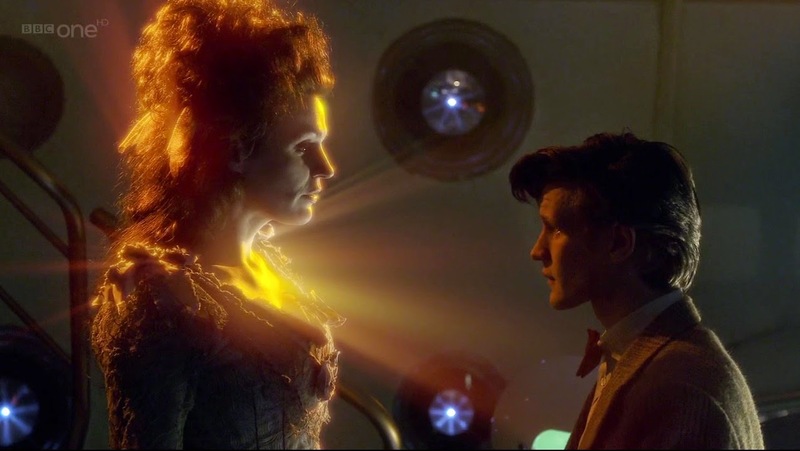 In addition to Classic Who references, this episode had the reappearance of the deceased River Song. It also had the return of the Great Intelligence, previously seen in "The Snowmen" and "The Bells of Saint John", but also as far back as "The Abominable Snowmen" and "The Web of Fear". Again, more Classic Doctor Who lore. Favorite Companion: I've heard a lot of complaints about her, but I loved Clara. She was spunky and fun and (at least at the start) she wasn't a romantic interest for the Doctor (and the romantic implication was VERY short lived). I also liked the complexity of her character being splintered throughout time. 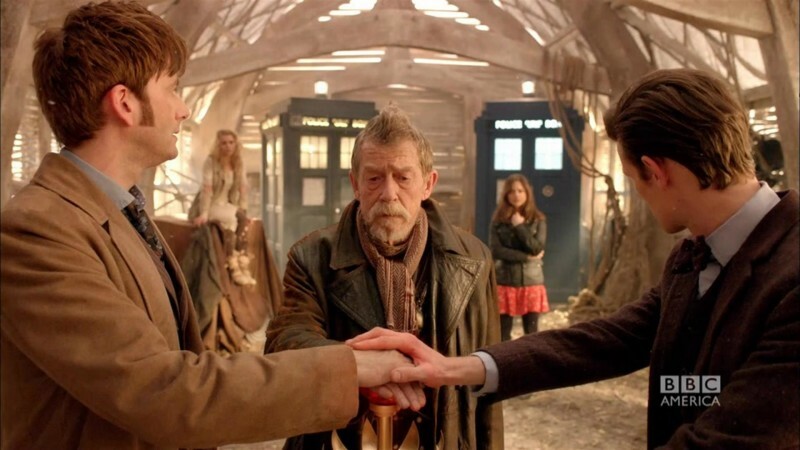 It brought an interesting aspect to the Doctor's previous adventures and a unique understanding of the Doctor, as she progressed forward with the Twelfth Doctor. Also, I definitely crushed on her. Above all, her story was very unique and I loved how it progressed, especially during her first season with Peter Capaldi. This Doctor is where I know a lot of people started. 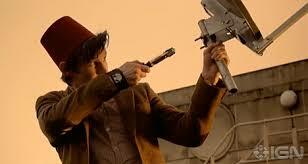 What did you think of the Eleventh Doctor? Who was better: 10 or 11? SPOILER WARNING: I won't get to Fallen Kingdom till way down the page so you can read up till you see the picture of the logo and be safe. I absolutely love the whole Jurassic series. 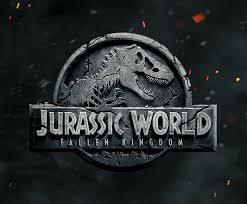 Since the title decided to change from park to world, I think it's best to just call it Jurassic. Five movies and at least two decent video games, plus the of course masterfully written source material makes the ten year old in me give a little squee every time I see that logo. A review of Jurassic World: Fallen Kingdom is probably redundant by now, so I thought it would be nice to go through the film series and see how we got to where we are now, what worked, and maybe even highlight some moments in the franchise I particularly loved (Or hated). Throughout the entire series there's going to be an ongoing battle for screen time between the dinosaurs and the human characters. While this fluctuates in who wins and who deserves it, I'd say the humans in Jurassic Park are the best the series would have. 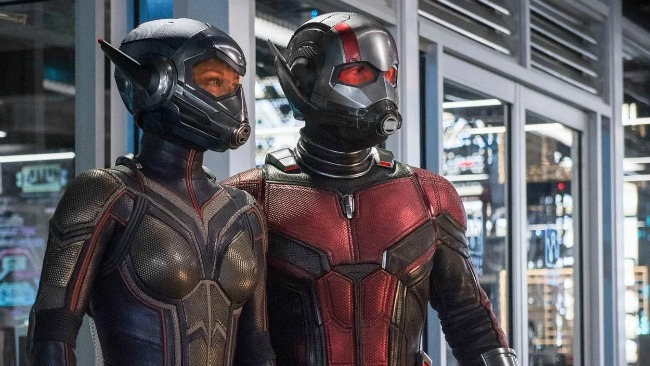 We get clear backstory and motivations for each character at a nice brisk pace so that when they make a decision it's clear why that character did what they did. Even the kids, Lex and Tim, who could've become a pair of Jar Jar's in the wrong hands were likable. This makes the intense scenes with the dinosaurs far more enjoyable because we love the dinos but we still want the humans to win. The dinosaurs of course are magnificent. This was the first time CG was used at this level in a major film and Spielberg at the time knew how to combine practical effects with the computers to fool the audience into thinking they were seeing real dinosaurs. Every appearance of a new dinosaur is given this beautiful moment to appreciate the creature, as if every one is a magnificent piece of art, which they are. 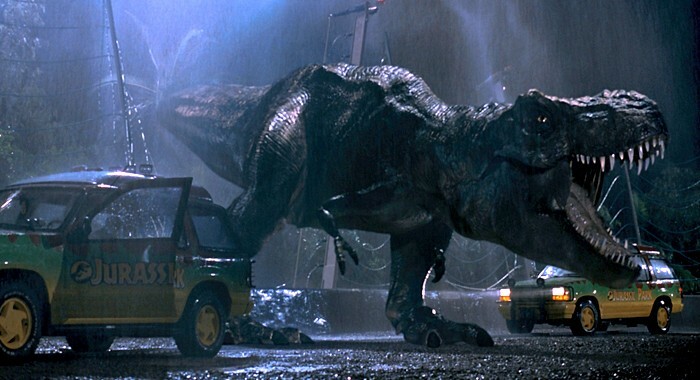 I will never forget being awed the first time the T-Rex first appeared. First she was talked up periodically throughout the film, then we see Tim react to seeing her with the night-vision goggles. Next is that goat leg on top of the sun roof, then we see it. Eating dinner like nothing in the world could disturb it. There's so much more that makes this scene great but just that alone was enough to know that we were about to experience something special. If the first film suffers from anything its the extremes it needs to go to in order to put its humans in danger. Spielberg has been criticized for the jeep scene's inconsistencies, and if you think about it the whole returning the power to the park thing doesn't really do anything in the long run since they escape the park anyway, but we're not here for plot. We're here to see dinosaurs, and that's exactly what we got. 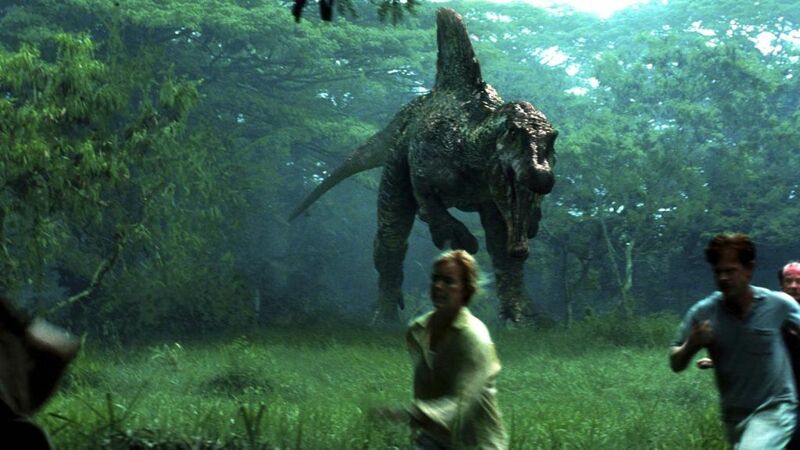 Lost World Jurassic Park suffered initially from trying to get us to care about the humans. Ian Malcom goes to a different island to rescue his paleontologist girlfriend who is there playing Jane Goodall meets Wilma Flintstone. We get them and a group of disposable mains plus a bunch of mercenaries types who are capturing the dinosaurs to build Jurassic Sea World that was apparently already built before Jurassic Park but was abandoned because Hammond I guess got bored. This is poorly explained but by the time we finally get on the island it was worth the wait. This film delivers far more dinosaurs than the first, including the beloved Stegosaurus. Our main goal ends up becoming centered around the T-Rex again, since because of reasons Daddy T-Rex is chasing our humans around the island. The raptors get a great scene involving long grass and some truly terrifying suspense as the mercenaries get picked off, but then we get what amounts to a Benny Hill sketch before we leave the raptors for the rest of the film. The climax has been both criticized and applauded for it's sheer nonsensical awesomeness. The T-Rex is taken to San Diego on a boat that it somehow takes over and starts rampaging through the city like a miniature Godzilla. We catch it and send it home to his mate and the adorable baby T-Rex that I loved as a kid and still do to this day. A lot of people criticize this movie in general for removing the wonder and awe the dinosaurs had in favor of a chasey action/horror film, but I like it. We had the awe when we were first introduced to these things, trying to do it again just wouldn't make any sense. We've established that dinosaurs are cool, now let us see them do cool things! Usually ending up at the bottom of a lot of people's list in this franchise, three was a massive stretch to get the characters on the island. A kid gets stuck on the island and a couple of suburban annoyances trick Alan from the first movie and his new sidekick to join them in hunting for the brat. I like this movie, but here's my issue: It has the least amount of human deaths than any of the other films. We get three. That's it. Fan favorite T-Rex gets killed by an even bigger dinosaur, Spinosaurus, This is probably the saddest moment in the film but besides one raptor kill marks the end of our death count. I know it's kinda dark to harp on the death thing, but since character development and the wonder of dinosaurs are now gone this was kind of all we had left. I will say this, even knowing that everyone is okay in the end we do get some incredibly intense scenes later. One is where we get to meet the Pterodactyls, a hole in the Jurassic franchise besides a brief cameo at the end of the last film and here depicted as something alien and terrifying.. The scenes with them escaping one giant flying dinosaur is incredible, though I call shenanigans on the fake-out death provided by Grant's sidekick. 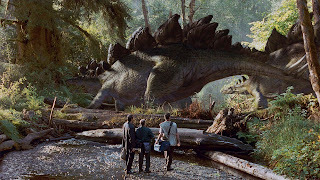 Next we have them trying not to get eaten by Spinosaurus while river rafting at night, that was delightful, especially since a lot of the CG was ditched for practical effects. The juxtaposition between them and Ellie's kid is also a fun romp and makes Barney seem incredibly twisted. Last but not least is the best scene with the raptors in the series so far when the humans try to return some stolen eggs. This is particularly intense because they are trying to communicate with the raptors in acts of gesture so that they don't get killed. 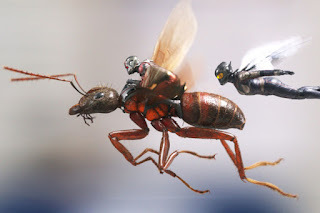 It reminds me of a scene from Congo where they are confronted by a silver back and our hero shows submission hoping it gets the thing to back off. Some people hate that the scene is ended by Grant making poor imitation raptor noises through a wooden toy but I thought it was clever. Jurassic World saw the park finally open and we get to see what Hammond intended for these monsters. We get hundreds of humans for the dinosaurs to play with, plus plenty of new dinosaurs to see. The plot is still not great, but it makes sense. Someone wants to weaponize dinosaurs and so they're trying to weaponize the thunder lizards. That works, but I don't buy the idea that people are getting bored of dinosaurs. There is no way on this earth that people could get bored of seeing a giant monster that they can only see after paying a fortune to travel to an island just to get near. The big new dinosaur is the genetic grab bag Indominous Rex. This thing makes for a great threat against the entire park as it tears through security and other facility workers. I was rooting for it to hit the gift shop areas until it broke out the pterosaur enclosure, then I was squeeing like an Anime fan as the vacationers were carried off by giant flying lizards. The only downside are the human characters we have to get to know. 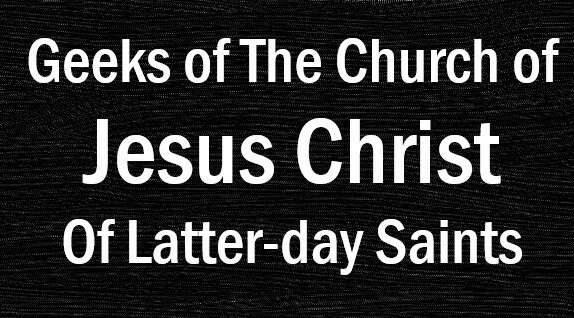 As in all of them. 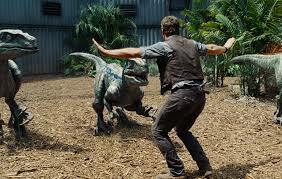 I know people like Chris Pratt because he spends all his onscreen time Chris Pratting around, and that's okay, but he barely makes sense since apparently his work in the Navy makes him qualified to train Velociraptors. Maybe I just don't understand the Navy, but to me I don't get the connection. Jurassic World Fallen Kingdom: WHERE ARE THE DILOPHASAURS??? Seriously where are the Dilophosaurs? They were a great dinosaur all the way back in one but besides a couple references they were never seen again. Did they die off? I know they're not scientifically accurate but I thought we were throwing accuracy out the window when Spielberg literally made up most of the traits of the Velociraptors and they're still around. Anyway, here we get the dinosaurs we've grown to love dying en mass because apparently the island has had a vulcano that is about to erupt. Some rich guy gets ret-conned into being Hammond's old partner and is trying to save all the dinosaurs they can before the island explodes, but his evil business manager want to sell off the dinosaurs like a horrifying version of Ebay. Okay fine whatever it gets the dinosaurs over to north America and get to play with them inside a mansion. Cool, I like it. We also get to see a few Allasauruses, which I was really into since they are Utah's state dinosaur. We also get an Indo-Raptor, which is just a smaller Indomonus Rex so he can fit inside a house. He works and I like him but I didn't like the fact that the scene where he tries to sneak up on a little girl hiding in bed stops the pacing of the movie like a brick wall. I get that it was great fodder for the trailers but it was near the climax that the whole sequence just felt forced and out of place, especially since we just saw the thing smash through a glass window to try and eat this kid. What's your favorite Jurassic scene? This movie was a breath of fresh air. I loved “Infinity War” but I don’t think anyone would argue that it was heavy and intense. Just like his origin story, this movie definitely played on a lot of humor. 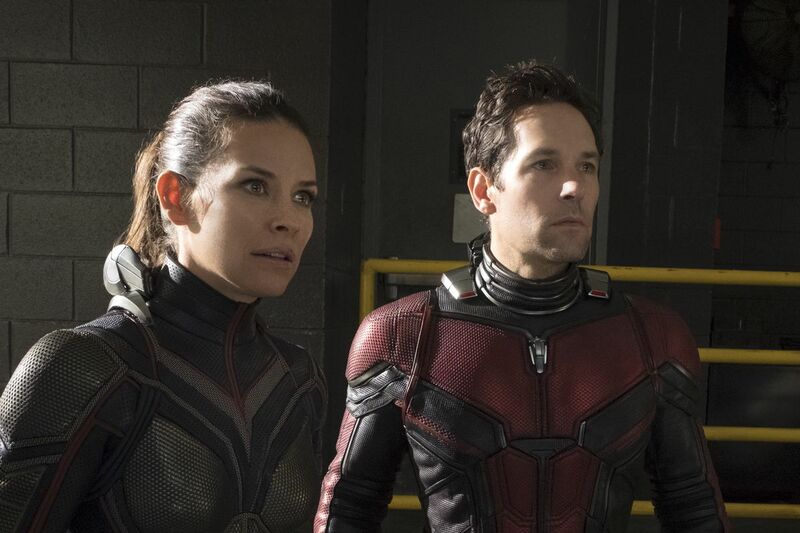 Still plenty of action, fights, and story, but it was light enough that it was kind of a lighter feel compared to “Infinity War” and the Marvel TV shows. And maybe it was just the week I had, but I needed a nice easy movie. 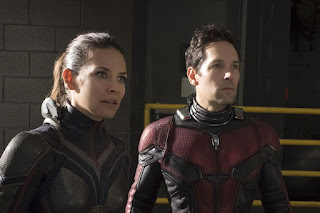 The unfortunate thing about this movie was that it came so close behind “Infinity War” that I felt like it was kind of lost in its shadow; the hype for “Infinity War” was so huge and then I felt like there was so little hype for “Ant-Man and the Wasp”. I’m certainly not Disney’s marketing team, but I would have thought it’d be a better movie for this fall, to start building hype up again for the next Avengers. A strength and weakness of the movie was the number of complexities in the story. In some ways there were so many parties in the movie to keep track of. At the same time, the number of involved groups kind of kept things interesting and added to the comedy. I need to go see it again to keep everything straight (or not, because then it’s funny). 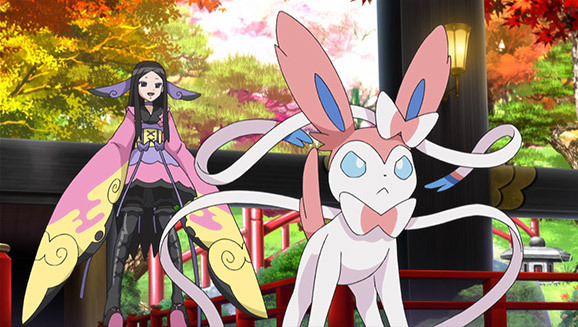 I'm back with some more Pokemon Theories (I was gonna do a Pokemon Timeline, but it seemed redundant, since I can just cite one of the videos that I've linked later on). But anyway, here I go.